A great layout is the first thing that catches your eye when you visit Urban Traffic School online at UrbanTrafficSchool.com. The design is simple, concise, and intuitive to navigate so you can find all of the information you’re looking for with ease. In fact, the overall design of Urban Traffic School’s website is one of the best we’ve ever seen. But we know that great design isn’t a be all end all for an online traffic school. So we decided to peel back a few layers and look inside at the inner workings of Urban Traffic School. In our review of the service below we look at a number of important factors including its legitimacy, its customer support, how it works, and how long the course takes. We end our review of Urban Traffic School with a brief discussion on the things we liked and dislike about the service the most. Is UrbanTrafficSchool.com A Legit Online Traffic School? Legitimacy is paramount to an online traffic school. Numerous so called “companies” in the industry masquerade as online traffic schools when in reality they are just scams. Naturally, it’s essential to avoid these scam companies and select one that is reputable, reliable, and trustworthy. Urban Traffic School passes our online traffic school legitimacy test with great marks. This is one legit online traffic school. They are registered with the California Department of Motor Vehicles for use statewide. Their DMV registration number is E0538. Honestly though, the customer service provided by Urban Traffic School is phenomenal. No other company anywhere offers support like it (though many are attempting to match it). For starters, Urban Traffic School offers 24/7/365 customer support. That means you can contact them with your question or concern any time of the day, any time of the week, and any time of the year. That includes weekends and holidays. While the best way to contact them (especially outside of business hours) is by telephone, email and live chat support are offered as well. Its great how easy Urban Traffic School is to use. Even those that aren’t a bit tech savvy will have no problem learning to use it. The first thing you’ll have to do is register with Urban Traffic School. Your safety and security is the company’s top priority. You can rest assured that your personal, ticket, and payment information will be kept safe by the company during every step of the process. The course itself comes next. Every piece of the Urban Traffic School course is designed specifically with the customer in mind. For instance, it is broken up into several intuitive chapters, each of which includes a variety of pictures and videos. All of the written content in these chapters is compiled in the simplest English possible so everyone can digest the included information. Each of Urban Traffic School’s course chapters is followed by a short quiz. These quizzes are designed to ensure that you’re actually retaining what you’re studying. They are based on the information in the associated chapter. You must pass each of these quizzes before Urban Traffic School allows you to move on to the next chapter. A DMV-approved exam is the final step of the Urban Traffic School process. It contains 25 multiple-choice questions. You must answer at least 70 percent of these correctly to pass the course. Urban Traffic School automatically sends your certificate of completion to the court and the DMV as soon as you pass their final exam. How Long Does the UrbanTrafficSchool.com Course Take? 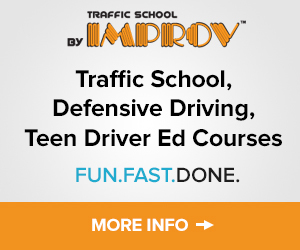 Taking an online traffic school course from Urban Traffic School is a breeze. Customers constantly compliment the company on just how fast the service is. While the course is designed to take around 8 hours to complete, no course timers are used. This means that you may complete the coursework in whatever amount of time you need, whether this is 1 hour or 12 hours. The things we like about UrbanTrafficSchool.com can be broken down into three words: simple, fast, and inexpensive. Every aspect of Urban Traffic School is designed with the customer in mind. This allows it to be as simple and fast as any other online traffic school in California. Seriously though, sign up for this course and you’ll be blown away by how fast you complete it. We also like the fact that Urban Traffic School is inexpensive. At $11.45, it’s one of the cheapest online traffic schools in California. And this is the only cost. There are no hidden costs or extra fees. To be honest, there aren’t any negatives to the Urban Traffic School experience. All in all, Urban Traffic School is one of the best, if not the very best, online-only traffic schools in California. It’s cheap. It’s easy. It’s fast. It’s reliable. It doesn’t get any better than that. Mostly a text based course with very little video, animations, graphics, etc. Some hidden fees and add on service that increases the base price. Only 2 chances to pass the final exam. I thought it was good. A little boring but I was able to get it done pretty fast. I was able to navigate the course easily but when it came to getting the certificate, that’s when the problems started. I requested an original copy be mailed to my address since the county where it was needed would not take anything else, but after the allotted time (7-10 days), still no certificate. After calling to inquire as to its whereabouts, I was told it was emailed (which it was not) then told they would mail the certificate and I should receive it with in 7 to 10 days, after having waited for 12 days already. I could not wait that long because it would not make it to the court in time. I asked to speak to a supervisor and was told by him that they mailed a hard copy to me 10 days ago, which never came. Then I was told they would send another by expedited mail if I paid for it. I reluctantly agreed since I had no choice. I won’t even go into the unreturned phone calls and run around I got in the meantime as it would take too long. Suffice it to say I strongly recommend searching elsewhere for a traffic school. What Is The Easiest Texas Online Drivers Safety Course?